So, the installation instructions quite clearly warn not to install this version over a previous beta. But then they include instructions how to “When using Flex Builder 3 Beta 3 with a workspace from a previous beta, please clean and reinitialize the workspace.”. Unfortunately for me this didn’t work. I’d fully uninstalled the previous beta. But when attempting to re-use the existing workspace even with the ‘clean’ steps undertaken, the result was a broken installation of the builder. It couldn’t find any of the SDKs. Uninstalling, getting rid of the old workspace and reinstalling then worked. Just leaving the job of manually setting up the projects again. This might be due to my configuration – I don’t keep project source files in the workspace – it only contains paths to the respective project folders on my system. On a more positive note, the whole thing feels a bit more spritely. Update: Actually, it is less of an issue to import projects than I first thought. In my first attempt I set my project folder and left the Project location at the default. This replicated the project files into the workspace folder. Not what I wanted. The solution, if slightly counter-intuitive, is to set the import from and the project location folder paths to be exactly the same path. 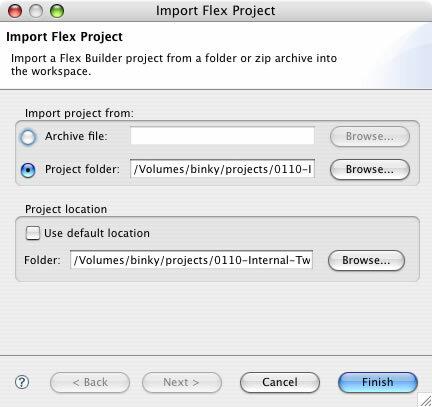 This correctly makes Flex aware of the project , while leaving the files where they should be. After the import – a quick clean then we are off! A good start-point to read more (a brief paragraph on each) is Ted’s OnFlex blog, and of course the Adobe labs site. I expect Ted’s “Player 9 installs” counter is going to go nuts. The final release of Flash Player 9 update 3 is released (previously code-named MovieStar) enabling H.264 support for Windows, Macintosh and Linux platforms from www.adobe.com/go/getflashplayer.